We were very fortunate in this meeting to host the world debut for the first production units of the VAF DC-X63 loudspeaker, the prototype having been unveiled at the Australian Audio & AV Show in Melbourne last October. VAF CEO Philip Vafiadis made the trip from Adelaide to present his speaker to a very enthusiastic audience. VAF press release information describes the DC-X63 as “the most technically sophisticated new loudspeaker under $3,000pr now Australian made." With 6 drivers precisely time aligned on 5 individually stepped baffles in a cabinet so intricate it requires robotic precision to make, the new VAF DC-X63 might be just that. “With over 10,000 owners, our DC-X loudspeaker has developed a cult like following in Australia since it was originally released in 1995. This new DC-X63 builds on this incredible legacy. Beyond an evolutionary step, the new DC-X63 is a quantum step in design, and actually mimics the way sounds are produced in real life” said VAF’s founder & CEO, Philip Vafiadis. “In the process we solved aesthetic as well as technical problems. A computer controls the machining of the profoundly complex enclosure. This houses and perfectly time aligns the 6 drivers delivering the most realistic 3D presentation of sounds of any DC-X model before it. The enclosure minimises stored energy in all its forms, so the amazingly realistic 3D presentation of sound is also very pure. An Acoustic Skin ™ elegantly covers all this complexity. This design allows each owner to personalise the look of their speakers to compliment their room, whatever their version of beautiful might be. This way every owner gets this amazing VAF sound with a look that they can choose for themselves”. The remainder of the system was provided by members, the front-end being a Playback Design MPS-5 SACD/CD player. This player has a modified Esoteric transport mechanism which provides excellent stability. The DACs handle up to 24/384kHz PCM. 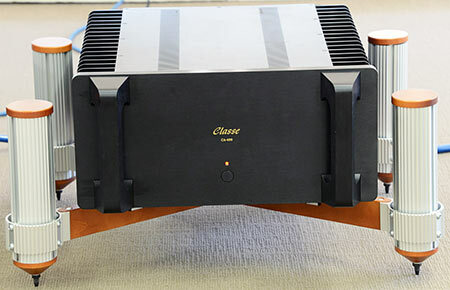 The preamp was the Classe CP-800. This is a well-reviewed preamp/DAC that has received many accolades. 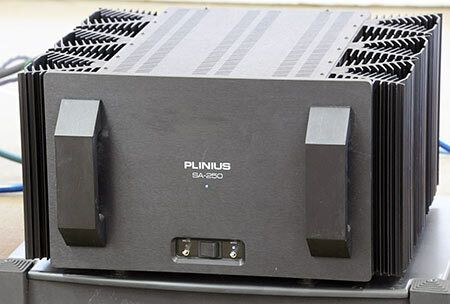 The power amp was a Plinius SA-250 which was used in both Class A & A/B modes. A Classe CA-400 was also on stand-by. Both of these amps are real powerhouses. The DC-X63 speakers are quite efficient, but since our room is large we like to have the extra power on hand. Phillip got things started with a very informative presentation about the speakers, he clearly has genuine enthusiasm and passion for his products and high quality sound reproduction. He explained the general principles of this speaker were high quality sound reproduction with cost savings made in the cabinet finish area. The ‘sock’ cabinet cover allowed for a wide selection of colours (easily changed by an owner to suite their changing decor) as well as avoiding the high cost of paint/polished lacquer finishes. He eagerly answered the many questions thrown at him, sharing with us both information about his speaker design and speaker design more generally. A great oral presentation to start proceedings! Once the music started it was immediately obvious the DC-X63 was a lot of speaker for the money. Our room was filled with a wonderfully engaging sound, full of detail but never fatiguing. The soundstage had great width and depth even if sitting off-centre. No matter what genre was played these speakers were able to produce good clean sound right across the frequency range, their ability to fill our large room, even down to the lower frequencies, was amazing. These are a speaker for music enthusiasts, the compromise of not having a high quality gloss finish for the cabinet would be completely forgotten once the music started, there was certainly a good buzz amongst those present about the sound we were hearing. We then had our member’s presentation segment with some great selections from Ray Eade via computer sourced music. After the break we had our usual BYO session with the usual great selection of music from members and guests. At the conclusion of the meeting I think the feeling was unanimous that these speakers indeed produced an outstanding sound for their price point and that Phillip’s presentation has been successful and very enjoyable, certainly the applause from those present indicated this. Not only a great Australian product but one that could compete with any comparable international speaker. Good quality. Good speakers - best ever heard. Speakers very impressive for cost. Interesting meeting - Philip knows his stuff. Speakers played every genre very well. Nice clean transients and well integrated soundstage. Many thanks to Philip for his very informative presence. The culture in this club is better than other audio clubs I know in Australia.